Harold M. Moe, 95, of Virginia, passed away Thursday, April 12, 2018 at St. Michael’s Health and Rehab in Virginia. A memorial service will be held Saturday, May 26, 2018 at Pike Town Hall at 2:00 pm. Arrangements are with Range Funeral Home in Virginia. To sign the online guest book or to send condolences, please visit www.rangefuneralhomes.com. Harold Myron Moe was born March 5, 1923 in Bemidji to Rudolph and Emma (Oase) Moe. On July 2, 1944, he was united in marriage to Doris Lauderbaugh. 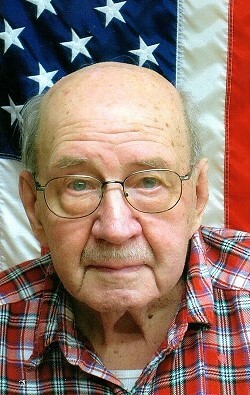 Harold entered the U.S. Army in December of 1944, serving until 1946. He was stationed in the Philippines and Occupied Japan serving as a squad leader. Doris & Family: We are saddened to learn of Harold’s passing. He was a real gentleman. Doris, we missed you after you moved now we get to see Karen once in awhile. Our prayers are for God’s loving hands on all your family.